Do you know that your use of disposable sanitary pads can harm the environment? Well, it’s not yet too late for a change! I only discovered reusable cloth menstrual pads and menstrual cups at the late age of 35! All those wasted years and wish that I had known about them sooner. I hope that you’re younger than I was reading this post now. Now is the best time to switch to eco-friendly menstrual products. Start using reusable cloth menstrual pads on your next period. Most of these products are made with natural or organic materials to ensure protection not just over your skin but the environment, too. Studies show that the use of disposables, an estimate of over 10 billion sanitary napkins and more than 5 billion tampons have been used in North America each year. Relatively, less than 200,000 applicators were pulled together along the coastal areas of America from 1998-1999. Having gathered this information, it can be said that switching to reusable cloth menstrual pads is the best way to help save the environment. People who want to start an eco-friendly lifestyle should start using all-natural products. They should begin with their period products. One of the best choices are the Period Mate Reusable Cloth Menstrual Pads. For a reasonable price, this product comes in set of 6 pads. It is also packed in a wet bag for convenience. 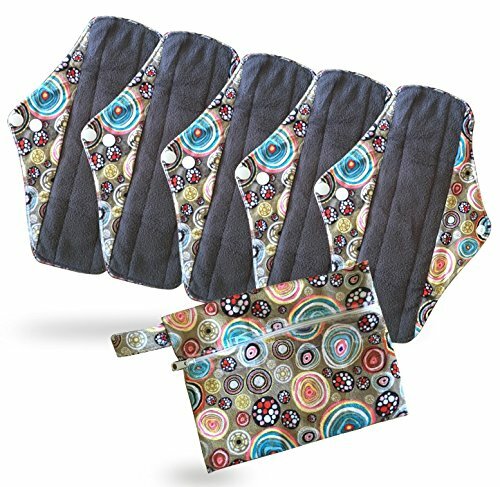 The Period Mate Reusable Cloth Menstrual Pads are 100% environment-friendly that they help get rid of landfill waste. Each cloth pad is easy to wash and definitely reusable. For more details about washing cloth menstrual pads, see our post: Top 10 Cloth Pad FAQ’s. A common problem among cloth menstrual pads is that they’re less absorbent than their disposable counterparts. But, these Reusable Cloth Menstrual Pads are all made of bamboo charcoal which makes for excellent absorption. Each pad is made soft and comfortable to the skin. Since they’re made of all-natural materials, these reusable menstrual pads guarantee to protect your skin. Aside from its super absorbent feature, this menstrual product also ensures no leak and stain free. Each pad stays in place when in use so its user can freely and comfortably move even when she has her period. Isn’t it amazing to know that switching to reusable menstrual pads makes you not just eco-friendly, but stylish, too? Yes! The Period Mate Reusable Cloth Menstrual Pads are artistically designed, not to mention colorful. They also come in a size that fits any user comfortably. And because all pads are reusable, they save you time, money and effort which were all spent when you were using the disposables. Reusability for these eco-friendly menstrual pads don’t just mean one or two more uses but years and years of comfort and convenience.